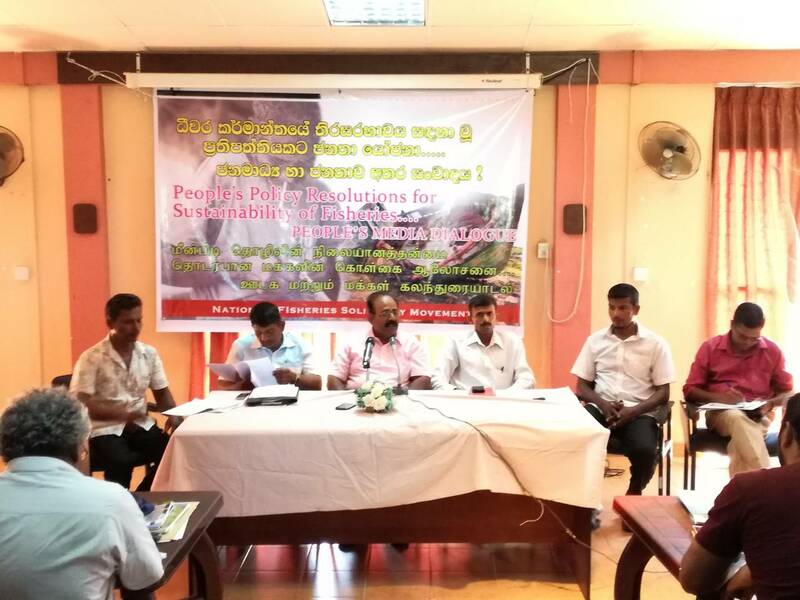 People’s Media Dialogue on People’s Policy Resolution for Sustainability of Fisheries was held at the Secretariat office of National Fisheries Solidarity Movement in Negombo. National Fisheries Solidarity Movement has given priority to be established a Sustainable Fisheries Policy in the country. NAFSO drafted a Fisheries Policy with the participation of fishers, community leaders, government officers, civil society organizations and professionals and handed over the fisheries minister in 2004. Although there were some attempts of the government to make a National Fisheries Policy, they were unable to establish a National Fisheries Policy until now. National Fisheries Solidarity Movement initiates to be established a Sustainable Fisheries Policy with the consultation of people, fishers and professionals. NAFSO organized different consultations in regional, district and national level to feed the draft of the fisheries policy and drafted policy was handed over the fisheries ministry engaging with the government process in preparing the National Fisheries Policy in 2018. This people’s Media Dialogue was organized to further strengthen the drafted National Fisheries Policy. The media dialogue was organized by NAFSO with various media agencies such as BBC, Lakehouse, Thirakaran, Lakbima, Lankadeepa, Suwarnawahini TV, Ada news, Maubima, Sirasa Tv, Ravaya, and independent journalists at Secretariat Officer in National Fisheries Solidarity Movement on 29th of June 2018. Representatives from partner organizations of National Fisheries Solidarity Movement, community leaders, representatives of fisher unions and civil society organizations used this opportunity share their experience consisting of challenges, changers and new tendencies of the fisheries context in the country. Representatives of Northern Province Fisher People Unity raised main two issues such as Indian trawler issue and southern fisherman’s migration in to the North. Issues related to construction of Port City, using of illegal fishing gears and increasing kerosene oil were highlighted in the media discussion. Engagement of National Fisheries Solidary Movement with the government in preparing the National Fisheries Policy was concerned in the event.